I couldn't resist taking this picture at C & J Nursery. We've actually made a jigsaw puzzle (on the computer) out of it and it's proving to be quite difficult. This is the front entrance to Cactus Mart, north of Palm Springs in California. We visited here early in our travels. And this is the back section. And along the road to San Diego along Interstate 8 was this Dudleya along the side of the freeway. If you look closely, you'll note the rain drops on the leaves. Just after this it snowed heavily. Lynn-Marie took this photo yesterday of a bumble bee on an Echinocereus flower. Yes, it's definitely Spring. Another way I can tell it's Spring is that in the week we were gone our lawn grew tenfold, and now it's too wet to mow it. By the time I can mow it I'll be harvesting hay! At another wholesale nursery, this time in Vista, California, I took this photo. I think this might fulfill our Mammillaria cravings! OK. I've gotten some sleep. Not enough, but one full night. As I can, I'll post a few photos from the trip - as well a few of flowers making a show now. This is the back of our van about half way through the trip. We added more later! I didn't always remember to take pictures, so things will be a little sketchy. The first place we stopped in Tucson, Arizona was Bach's on the north side of Tucson. They have a very nice retail house and a vast area of wholesale plants. Dan Bach received a significant award at this past year's CSSA Convention for the contributions he has made to the hobby. One of the plants he produces in the wholesale department is the Totem Pole Cactus (Lophocereus schottii 'monstrose'). Quite a sight. We're back, but after driving straight through from Ojai to Portland, I'm exhausted. The only agenda now is sleep. We weren't able to get to a few nurseries we wanted to get to, primarily because we didn't have any room left in the van. We may just make another trip down to Ojai and north in May to get the other plants we wanted to get... But right now I'm exhausted just thinking about it. Photos beginning tomorrow. Greetings from wet and cool Southern California. We're currently in Carlsbad, California and we've been to wholesale nurseries in Northern California - Tucson, Arizona - and the San Diego area of Southern California. Tomorrow we head north to the L.A. area ( nurseries in Riverside, Pasadena, Ojai & Santa Barbara, and a visit with a friend at Santa Clarita). Then it's north to San Francisco, with a possible stop at Santa Cruz. After that, home via the Sacramento Valley. I should have a few good photos when I get back. We finally were able to get our trip off the ground. While we're gone, our son stays at our place and takes care of the animals (the dogs go with us) and for security purposes. I'll try to blog from the road, but during the first few days we're traveling fairly long distances so I'll probably be too beat to blog. But I will be taking pictures and I'll post as able. In the meantime, you get a little break from my babbling on! How did this Redwood get in our backyard? Not succulents. Just potentially big trees. This is a Coast Redwood (Sequoia sempervirens) in our back yard, outside our greenhouses. (The first picture includes a magnolia blossom.) The first owners of our house brought home a burl as a souvenir and planted it, and off it went. The bark, which is quite soft but very thick is a favorite of the squirrels, who take big chunks. These are just small samples, growing as tall as a 30 story building (115 meters) and living to the ripe old age of 2200 years in the coastal forests of Southern Oregon and central and northern California. They really are best in the forest, as they're a little messy as a landscaping tree...but, hey, we take what we get and...enjoy our plants! While we were sipping our morning lattes, Lynn-Marie commented that it seemed like it was a whole lot easier to prepare for a road trip when we were a whole lot younger. Now it seems that every step of preparation is harder than ever. So...no photos today. Too tired. Heading out on Thursday morning -- at least that's the plan! This is a reminder that the Oregon Cactus & Succulent Society will have two shows and sales this year, and from my perspective, they're coming up all too fast! But by then these Senecio rowleyanus (String of Beads) starts should going gangbusters. The first sale is at the Portland Nursery on Division St., June 18-20 and the second one will be at Portland Nursery on Stark St., July 16-18. 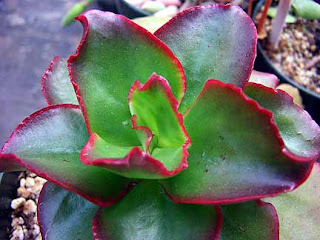 On July 11 (1 pm) at the Stark St. store, I'll be doing a basic introduction to growing cacti and succulents. If you live within striking distance, I encourage you to come to any or all of the above. They're going to be looking quite nice by June. A couple of pictures of Echeveria 'Blue Waves' tonight, first of the plant and then of the flower (sorry it's a little fuzzy). There are lots of "blue" Echeveria hybrids and some are surely synonyms. This is one of the ones which certainly deserves it's name. I've posted photos of this plant before. They're easy to overlook at this time of year, what with all the succulent flowering going on! But they just continue doing their thing. They're almost through growing their new leaves as you can see. The old leaves will soon be a thing of the past. These three photos are by Lynn-Marie. These photos were taken a few days ago. Today they were wide open and I'll post those photos tomorrow. Until then, enjoy your plants. Time for another Echeveria cultivar. This time it's Echeveria 'Super Star'. Enjoy. We have a very busy week ahead. If I post anything it'll be late at night. Another view of a growing area with a mixture of echeverias, cacti and a few other succulent species. Over the years one of the most common questions about cacti is "Doesn't it take a long time before they flower?" And of course the answer depends a lot on which cactus. This, for example, is Mammillaria schwarzii and each of these little starts is under 1 inch in diameter. Questions answered. Enjoy your plants and have a happy Easter. This is our confabulation of weird old men (Cephalocereus senilis crests). Like most of us, they're a little twisted with age! Just another area of the main greenhouse. Don't get too bored. I won't be posting much over the Easter weekend. Another bench with mostly haworthias. Not a very exciting view but if you get "down, dirty and personal" with the plants, it can be quite fascinating. Like I say, always keep a magnifying glass handy! The weather forecasters are all in a tizzy about a windy, late winter storm which should hit us tomorrow. It's already bringing heavy snow to the mountains and tomorrow should bring 80 mph gusts to the coast and 50 mph gusts to us. We can and do get some pretty wicked storms through here every couple of decades (in my lifetime, there have been two, neither of hurricane strength). My guess, however, is that the bluster on the TV news programs will be the strongest gusts we'll get. If I'm wrong, I'll confess tomorrow.